Brief Synopsis: The Justice League celebrates the recovery of Maxwell Lord while Despero returns to Earth. 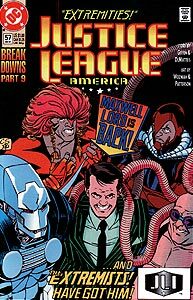 Issue Notes: "Breakdowns: Part 9": This is the ninth issue of a multi-part story crossing through Justice League America and Justice League Europe dealing with changes in the League following the loss of Lord's guidance. In a video conversation between Blue Beetle and Paris police Inspector Camus, Beetle mentions that Booster Gold has joined the rest of the active Justice League at a celebration party for Maxwell Lord's recovery in the Secret Sanctuary cave. Though mentioned, Booster Gold is not actually pictured in this issue. Other people revealed to be to be at the same party include Big Sir, Bluejay, Captain Marvel, Catherine Cobert, Clock King, Cluemaster, Crimson Fox, Elongated Man, Fire, Flash III, General Glory, Guy Gardner, Ice, Inspector Camus, L-Ron, Major Disaster, Martian Manhunter, Maxwell Lord, Metamorpho, Michael Morris, Multi-Man, Power Girl, Rocket Red #4 and family, Silver Sorceress, and Sue Dibny. If Booster was still present at the party when Inspector Camus arrived, it would be the first time that the two characters were in the same location at the same time. Boosterrific Review: As "Breakdowns" extends into its fourth month, Justice League comic books have forsaken their previous character-driven comedic action in favor of episodic installments of an overly melodramatic soap opera, much to its own detriment. In this latest installment, Max Lord returns from a coma, Despero returns from infancy, and the Extremists return from death. Any one of those events should be an exciting affair in its own right, but here they succeed only in proving that too much of a good thing is a mediocre comic book.